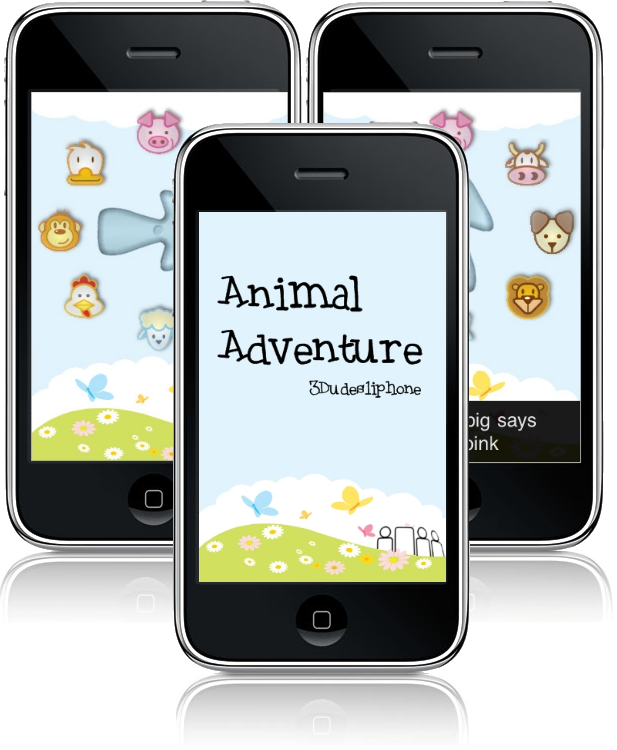 Animal Adventure is a version of the classic game “See and Say” for kids. This app is still extremely simple overall but significantly more complex than Wifive from a development standpoint comparatively. With this app we learned how to animate, rotate, and enhance images with shadows and levels of transparency. We are not graphic artists so it is some amount of trial and error to get things looking OK. We were able to get the arrow in the middle of the screen have a natural feel to so that you can hold and move it or send it spinning with a swipe. Our app also allows you to shake the iphone to get the arrow spinning. With an exponential slowdown algorithm we gave the spinning arrow a natural look as it lands on an animal and pops out a view from the bottom that says something like “The pig says oink.” This feature is implemented with an off-screen view that “peeks in” and is populated with the phrase and a picture of the animal the arrow chose. This action is coupled with a corresponding sound bite of the animal noise.